King of Shaves Post Shave Face Balm is rapidly absorbed and leaves skin matte, moisturised and supple. It is enriched with anterbacterial Tea Tree Oil and Hemp Seed Oil to help aid skin healing. It includes menthol for a refreshing cool feel. 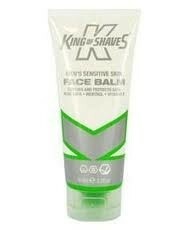 King of Shaves Post Shave Face Balm is unfragranced, alcohol free and non-greasy, making it ideal for sensitive skin.